Police in Austin respond to reports of an explosion earlier this month. TWO PEOPLE WERE injured in another explosion in Austin, Texas last night, and police weren’t saying if it was caused by a package bomb like the three that detonated earlier this month elsewhere in the city. 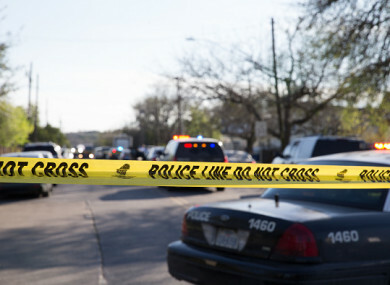 The latest blast occurred around 8.30pm in a suburban neighbourhood known as Travis Country in southwest Austin — far from the previous three that were all in residential areas in the eastern part of the city — and investigators didn’t immediately confirm what caused it. But police Chief Brian Manley repeated previously issued warnings for residents not to touch any unexpected packages left at their homes. “What we have right now is a scene where it is obvious that an explosion has taken place,” Manley said at a hastily organised news conference near the site of the latest blast. He urged people within half a mile to stay in their homes and said authorities would keep the surrounding area blocked off at least until daybreak “given the darkness and size of the area that we want to go in and check”. Because “we have not had an opportunity to look at this blast site to really determine what has happened”. “It is important right now for anyone in the neighbourhood behind us to remain inside and give us time to work through this,” he said, adding that any witnesses should call 911 and report what they saw. Two men in their 20s were hurt in the latest blast. Police said they were hospitalised with injuries that weren’t life-threatening. It was the fourth explosion to rock Austin in less than three weeks. The first was a package bomb that exploded at a northeast Austin home on 2 March, killing a 39-year-old man. Two more package bombs then exploded farther south on 12 March, killing a 17-year-old, wounding his mother and injuring a 75-year-old woman. Manley originally suggested they could have been hate crimes since all the victims were black or Hispanic, but now says that investigators aren’t ruling out any possible motive. Last night, police blocked entrances to the neighbourhood where the latest blast occurred and put up yellow tape about half a mile from the home where it happened. Despite the order for those living nearby to stay in their homes, neighbours milled around just outside the tape. Some reported hearing loud booms but couldn’t provide many details. FBI agents arrived to conduct interviews. Sunday was the final day of the South By Southwest music festival, which draws hundreds of thousands to Austin every March. It is also the end of spring break for many area school districts, meaning families who were out of town in recent days are returning to a city increasingly on edge. The explosions occurred far from the main South By Southwest activities, though a downtown concert by The Roots was cancelled on Saturday night after a bomb threat. Authorities later arrested a 26-year-old man, and the incident did not appear to be related to any previous explosions. Email “Two injured in fresh explosion in Austin as police investigate series of parcel bombings ”. Feedback on “Two injured in fresh explosion in Austin as police investigate series of parcel bombings ”.